Sudanese soldiers stand guard on armored vehicles as demonstrators protest against President Omar al-Bashir’s regime near the army headquarters in the Sudanese capital Khartoum Thursday. A military council has taken control of Sudan and arrested longtime President Omar al-Bashir, the country’s military said Thursday. The move comes after opposition protesters recently gained new momentum in demanding al-Bashir leave office. Sudan’s defense minister, Awad Mohamed Ahmed Ibn Auf, said the “regime” had been removed and its head arrested, as he announced the coup in a televised statement. The minister said a transitional military council will rule the country for two years. Protesters have been calling for al-Bashir’s ouster for months. 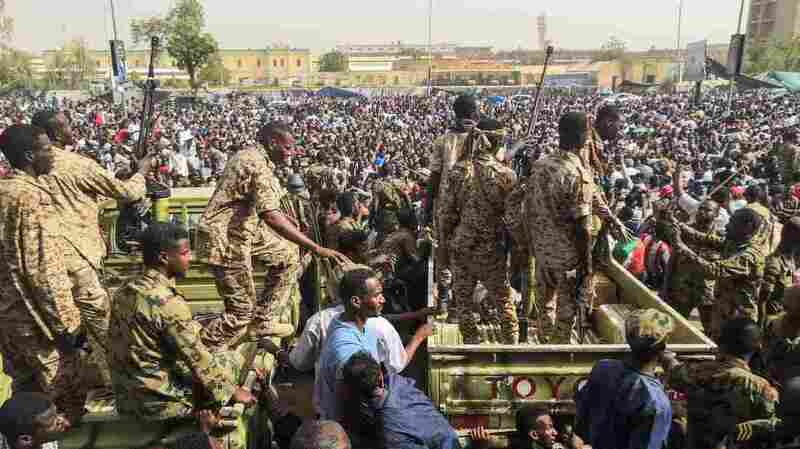 Thousands swelled the capital Khartoum’s streets as the military promised to make an important announcement earlier Thursday. Protests began in December over the price of bread after the government ended subsidies. But they spread to political concerns and protesters demanded al-Bashir’s ouster. Since Saturday, tens of thousands have maintained a protest vigil near the military headquarters in the capital Khartoum. The armed forces have been deployed around the capital’s main roads and bridges, the BBC reports, and the city’s main airport is closed. But Col. Gaafar Muhammad Nimeiri led a second military coup in 1969, according to the U.S. State Department’s history. Nimeiri became prime minister and the military banned political parties and dissolved parliament. He survived multiple coup attempts before succumbing to another military coup in 1985. Gen. Abdelrahman Swar al-Dahab led the military overthrow of Nimeiri in that coup. This time the military handed over power to a civilian government of Prime Minister Sadiq al-Mahdi after elections in 1986. Al-Mahdi only lasted three years in power afterward. Omar al-Bashir, with the support of military officers and an Islamist political party, took power as leader of a junta in his own coup on June 30, 1989. Al-Bashir had been in power almost 30 years. The International Criminal Court in the Hague issued warrants for al-Bashir’s arrest in 2009 and 2010 for genocide and crimes against humanity in Sudan’s Darfur region.